You are here: Home / Appetizers / Oven Roasted Chestnuts… It’s Easy! I’m the only one who likes chestnuts in our household. That’s okay because they’re easy to prepare, so I can make a small batch just for myself when I want them. My mom used to boil them, which is also very good, but I prefer to roast them in the oven. It’s not quite (cue the music) “roasted on an open fire”, as we hear in The Christmas Song, but with (more music) “Jack Frost nipping on your nose”, this method is a a deliciously close second on this chilly “winter’s almost here” kind of November weekend. As a teen living in the Azores, I always enjoyed chestnuts when they were in season. At the time, we had less access to chestnuts from other countries, so we took advantage of these tasty treats when they showed up in the shops of our small islands. There’s a popular saying in Portugal “no dia de São Martinho, vai à adega e prova o vinho”. This means, on St. Martin’s day, go to the wine cellar, and taste the wine. This is because wine is typically made in September, so the new wine is ready to be sampled around mid November, which is traditionally on St. Martin’s day (November 11th). Roasted (or boiled) chestnuts pair very well with new red wine, so it’s very common to enjoy both at people’s “Adegas” (cottages where the wine is made). In mainland Portugal, street vendors roast them and sell them in paper cones. I’ve never tried these, but I hear they’re incredible… another one for the bucket list :-). I also have fond memories, as a kid living in Toronto, of eating street vendor roasted chestnuts outside of Honest Ed’s after my parents were done their shopping. It was usually cold outside and this warm treat would really hit the spot. 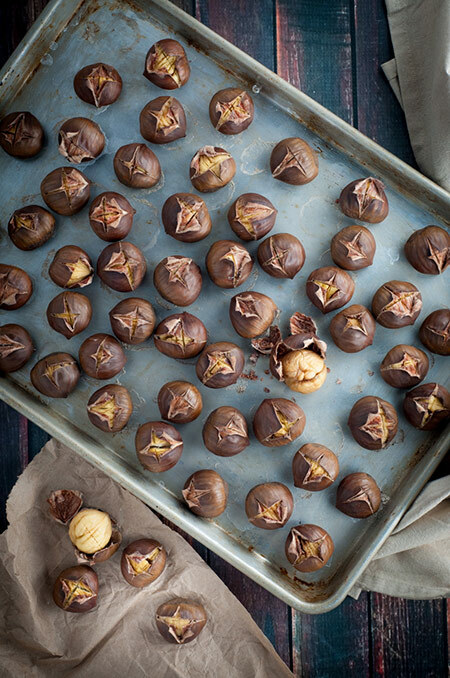 Roasting chestnuts may look complicated, but it’s actually super easy. Basically, you give each chestnut a small X cut on top and place them on a baking sheet (cut side up). Then roast them in the oven for 25 minutes at 425 ºF, and voila! A tip I recently learned is to give them a salt water bath after cutting and before roasting. This gives them a subtle, very pleasant salty flavour. This step is optional. Do NOT forget to make the slits on top. I’m not kidding. No, really. I can’t stress enough how important it is to cut them on the top before roasting. Unless you want tiny chestnut explosions in your oven (that are difficult to clean), don’t miss this step! Of course you can buy ready-to-eat chestnuts nowadays (I think you can find just about anything packaged these days), but there’s something special and good about fresh, warm roasted chestnuts. I’ll take fresh any day! If you can get fresh chestnuts, I encourage you to get that “chestnuts roasting on an open fire” experience for yourself (you don’t have to sing…unless you want to). With Jack Frost nipping on your nose, stay warm and eat well, friends! Simple straightforward instructions on how to roast chestnuts at home. 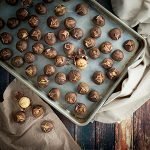 Chestnuts are delicious and a perfect snack anytime. Add water and salt to a medium bowl and mix the salt well until it's dissolved a bit (doesn't need to be fully dissolved). Add the chestnuts to the water and mix them in the water for a few seconds. Using a sharp paring knife, cut a cross on the top of all the chestnuts and place them on a baking sheet. Place the baking sheet in the oven on the middle rack and bake for 25 minutes. Serve the chestnuts hot. Enjoy! The salt water bath isn't absolutely necessary but it adds a nice subtle salty flavour to the finished chestnuts.